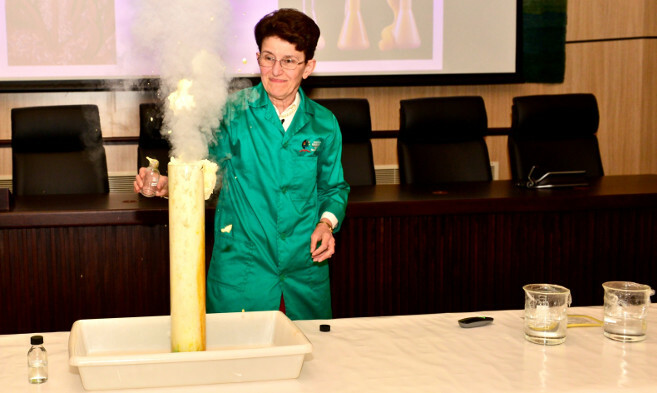 Physical Chemist and former UKZN Distinguished Teacher Award recipient, Professor Bice Martincigh, presented her inaugural lecture to an auditorium packed to capacity with colleagues and students. Martincigh epitomises the seamless marriage of research, teaching and community involvement. Best known for her ground-breaking studies into the efficacy of sunscreen products, Martincigh has a number of other research arrows in her quiver besides photochemistry; including an interest in environmental chemistry, solution thermodynamics and more recently, nanotechnology. Martincigh used her inaugural lecture to share details of her personal journey to the professoriate. Born of Italian immigrant parents and growing up in Umkomaas on the KwaZulu-Natal South Coast, she recalled how she could not speak English when she started school. ‘I grew up speaking first Friulano, then Italian, then English and Afrikaans. The Italian community was very tight-knit. The families worked together, went to church together, and built the Italian Club together. When I started school, I spoke no English, but I learned quickly,’ she said. After attending Kingsway High School, Amanzimtoti, Martincigh enrolled for a BSc majoring in Chemistry and Mathematics at the former University of Natal (now UKZN). She went on to complete all her postgraduate studies through to PhD level on the Howard College campus. Martincigh started her working career at the then Natal Technikon (now DUT) before returning to lecture at her alma mater. Her research career has embraced a variety of areas. For her PhD studies, she investigated co-ordination complexes in order to deduce whether primary or secondary nitrogens made stronger bonds to the metal ion. ‘Such knowledge is important if one is removing, for example, pollutants as one can then design the appropriate ligand that must be added to bind and remove the contaminant,’ she explained. Through a colleague and mentor, Professor Leo Salter, Martincigh became interested in photochemistry, that is, the interaction of light with matter. Her research investigated the active ingredients in sunscreen and how they interact with light. ‘What happens when one applies sunscreen to the skin is that the absorbers, or active compounds, in the sunscreen absorb the solar radiation,’ she said. ‘However, some molecules degrade, or react with the skin, and I looked at what happens: whether the product loses its efficacy, or whether the sunscreen can damage the skin,’ she said. Martincigh’s research group has investigated a variety of sunscreens and have found that some are stable while others degrade. ‘Our research is of public interest. After all, one of the most important cancer prevention measures the public is told about is the use of sunscreen. It follows that if these sunscreens are not effective, then we have a problem. This is a topical issue since South Africa has a high incidence of skin cancer,’ she said. Martincigh said she is happy in her career as a lecturer, researcher and chemist, adding that she finds the research component of her job exciting. ‘It is the thrill of new knowledge. I enjoy teaching students. I find it satisfying when I know I have given a good lecture and that the students understand; when their eyes light up and they are having fun. Even if it’s just one or two, it’s worthwhile,’ she said.